Deep Time…do we imagine such a dislocating immensity as to put human time out of joint? We rightly fear a yawning from behind us; we peer ever deeper and hear the maddening reverberations of a first static, but we have yet to see a sound beginning. Our research out into space remains a mute stone dropped down a bottomlessness. Deep Time…but already we measure words to it, depose of it, grave out space for it, move away from it. Let us more safely call out: geologic time. Geology: step back from the depths of space, intend to Earth and read in its stratified visage but a symbol of that terrible depth. Still there remains no vestige of a beginning, no prospect of an end. The primordial exceeds our efforts, yet we fashion a comprehension by rocks. Terror will not be banished; but now, from this merciful remove, we can speak and, in the abstract regularity of numbers, account time. Chronostratigraphy: we are keeping time on Earth. Here I am mistaken and our stories cannot convene. For below our reasoning there is the depth which threatens betrayal, but we agree — we must agree — to hold ourselves to the conceit of time. What else are we to do? Agreed: we will have a first, an Archean, eon, and the archive of time will begin with those oldest known rocks. We can hold these Archean rocks in our hand and anterior to all other earthly rocks. Time is found deposited in the archive, a first deposition in the proceedings of geologic time. Our chronicle begins and proceeds, by convention, by maintaining us away from the abyss. Earth will remain to those depths. Our time will end; it is not equal to the measure. We call upon the oldest rocks as first witness to the continual procession of ignition, metamorphosis, sedimentation — orogeny, erosion, deposition. In what follows, we digress, but remember that until the end we will always be speaking of geology. The current geologic epoch has witnessed disruptions of an entirely new order. A new surface of indelible depositions covers the deepest rocks of the Earth; concretions on the order of gigatonnes and of cubic kilometers spread over the crust. Add anthropic to the orders of rock: anthropo-lithogenesis. Human activity constitutes new strata. Equatorial concrete pours. And attendant erosions: cutting canals, opening pits, grading the rail, placering the hills, ramming the earth. Earth works: the beginning of our own deposition: we give pause to the intonation of holocene and cause to yet a newer intonation of anthropocene. If we speak in only the most passive sense of this word – the geologic sense of precipitates, of new strata successively formed – deposition will have many remainders for us. The word itself remains as a concretion, as its own sententious deposition. Bedded above geology we find sediments of the usage in law, and liturgy. To depone, to depose, to deposit: three verbs in matrix, as a noun of action. Read: the witness lawfully heard in absentia; the conjuration of another’s permineralized experience; the safeguard of testimony out of time. The ousting of a figure from high office; the removal of a body; the threat to a corporation or to the rule of law. How could we hear just one deposition? We are in a chamber of hard surfaces and echoes. The task here is to not decide, the better to hear. We can learn to see such encrustations in the most inconclusive of our actions and the most humble of our stones. The first San Francisco was built of wood and mineral wealth, an outsized boomtown erected in madness, fixed upon gold. More than an account of wealth, the perfect metal holds a secret augur for it will not tarnish, will not corrupt; gold is all that our putrescent bodies are not. That brash city did not stand for long. Old San Francisco proved the volatility of dross gathered beneath the altar of the Perfect; that which accumulates in pursuit of the incorruptible is naught but human and violent. The city is more slag than lode. By Nature’s agitations was the crucible of this crazed experiment heated. And so the city burned for three days. The wooden city could not have ended any other way. As the conflagration took buildings, it graced the civic corporation with a preview of the end. Against this vision subsequent generations set a nativist pride, a commonplace of strangers incorporated as one under duress. Have not we all been told how people are noblest when forced to act in coordination as one body and purpose? Truly though, here the corporation assembled, the eye of a giant, to watch what it could only imagine were prescient flames. What delirium must have accompanied that devastation, where none could find their way and all were deposed from power. Deranged forces turned upon their own city; firefighters set dynamite to clear firelines but only toppled buildings and fueled the flames. This city came breech end first, feet to the flames and head turned wrong-way-round in memory of its own death. For San Francisco this would always figure as the primal scene, as trauma itself. Fire disgraces the wooden city and then the iron city, at Chicago, at Boston, at Baltimore. Fire terrorizes our engineers, spurring them to the possibility of structural concrete. And fire will assail our new gray buildings. In , flames break over the reinforced-concrete walls of a New Jersey borax factory, and while they twist the iron fixtures and melt the dynamos, their heat does not harm the artificial stone. Concrete is the first to survive the infernal trial. Only fire will hold this history together. Fire has always been the attendant spirit of concrete; if human artifice has usurped upon that genius, it was only by the thinking of fire that we could do so. It is an elemental reckoning, but it holds true. Witness Vitruvius, Roman architect and builder, who presided over the advent of hydraulic cement in human enterprise, who synthesized observation and material research into the monolithic works of imperial Rome, concretions yet remaining to the earth. Stones, are blended of the elements: those which have more air are soft; more water, are pliant from the moisture; more earth, are hard; more fire, are more fragile. Romans had long used the action of fire in kilns to drive the watery elements from limestone. The simple mortar of early Roman construction was made thus of friable, fire-constituted quicklime. Remembering the Catacecaumene from Greek manuscripts, Vitruvius sought out this same potential beyond the kilns. If therefore, in these places there are found hot springs, and in all excavations, warm vapours, and if the very places are related by the ancients to have had fire ranging over the fields, it seems to be certain that by the violence of fire, moisture has been removed from the tufa and earth just as from lime in the kilns. Indeed, the heat of Vesuvian fires, at an order of magnitude greater than that of the Roman kilns, had once blasted the lime and marble of the volcano’s terrane, the modern day Alban Hills, where slaves were put to work mining the pulvis puteolanus. A moisture-starved heat was still present to that stone and when, in construction, it was made like the mortars of quicklime, it seethed and boiled and distinguished itself by the quality of its concretions. This cement, poured over a course of rubble, would set and harden even under water — the so-called hydraulic property, the first hydraulic cement. Stones are excited by the fires of the earth, great energies come to abide in them. A telluric promotion can thrust stone into the path of human artifice. In giving the history, we say, albeit unfaithfully, that these elect minerals waited in stratified hills for the catalytic waters of the aqueducts to release those fires anew. Yet the power is latent and the heat that comes in the exothermic cure of the cement is the very heat of the volcano. We can justly claim that fire holds compositionally in stone, and that some stones are more fiery than others. In this excitement, the stuff of the Earth does seem closer to our human experience, as though its vitality could sympathize with our vitality. And little is more vital to our human selves than storytelling. A figure takes up a rock from alongside his path, he regards it in his hand, then throws it into the air, counting to himself…one, two, three…and the rock falls back down to rest at his feet. He walks away to tell of a stone and the numbers he reached. And what is his story? His numbers will have meant nothing, the stone has gone nowhere and noticed nothing. Natural cement has the potential of the stone at apogee. Suspended energy allows a place for our narration to take, just as it makes for grander, stronger buildings. We give a history, fitting a geologic process along the sapient arc of creation, through the rest of time and into the denouement of industry. Thus from limestone, by vulcanism, by art, concrete was man’s first made stone. Industrious as we are by our stories and monuments, the equation will balance from stone to stone. Imagine now the modern rotating cement-kiln. A hundred-meter inferno for which the instant vaporization of used tires makes cheap fuel alongside coal, petroleum coke, heavy oil or flare gas. Limestone and siliceous clays are heated to melting and partial vitrification, that is to say, until clinkering. Along with these burning stones, toxic materials are easily disposed into the flames where heavy metals are secured in the chemistry of the clinker. Hot immaterial whiteness tumbles from the decline of the kiln which turns about its long axis once or twice a minute, advancing a rhythmic load that falls away from rising walls to move round again. The cooling clinker’s heat is fed back into the demands of the kiln before fine tritulation and shipment as Portland cement. This monstrous artifact is a volcano; man makes himself like the volcano and his energies are chemically stabilized in potential. And what is this ubiquitous stuff, billontonnes per annum? Leaving the elemental conditions of the kiln, it is anhydrous and remains hygroscopic, it wants for moisture and will absorb any trace thereof. To sate this want — to mix with ample water — gives it plastic form. Thus the cement paste we admix with sand and gravel, in construction, to form our concrete. Once poured, hexagonal rods of ettringite will set the mixture and allow for the strengthening formation of ever-enmeshing tubes of the vitreous silicates. Yet the life of cement is short. We guard it closely from the time it leaves the plant, we guard its potency, to keep it safe from the effects of moisture over time. Stones are promoted out of geology and brought into fatal lockstep with the time of human societies, cement has but three months and we begin to worry for its efficacy. Will it yet work for us? Will it conform to our industry? How far can we project the artifice of our chemistry? Of its own nature cement intends back to the pre-fired stones it once was. The action of our kiln cannot stave off entropy for long, cannot hold things back from settling down into the condition of stones. Our chance is to excite the thing to a more volatile state and make use of it quickly, to satisfy our intentions instantly, before the facts of existence come to roost once more. We scare up the material. We drive stones into time, keep them away from their geologic condition for just as long as we can. To make our stones, we must strike while the clinker is hot. The equation will always balance from stone to stone. What fire and man have wrought together, fire alone cannot undo. At the borax factory we realized some secret directive by which to keep our cities safe from fire’s harm. Now concrete would be poured in defense of the city and of the corporation, and as a ward against loss and against end. Can we bid for a geologic fate? And if so, would we call it erosional or cratonic? In San Francisco, the corporation depones in stone, stone to be entered into the first and last archive of the Earth. Though much of the city may erode back into the components of its own admixture, there remains the possibility, the necessary promise, of its abiding record here atop a stratigraphic column. The civic deponent as geologic stylite. These names are epitaphs. Looking through the lens will keystone an engraved ground like a headstone. This might serve as a reminder that there are no graves in San Francisco, that the dead were all evicted from their graveyards in . There was no room for them in the emergent economic order of the day. Here, human names are no longer kept in stone, their remains are banished before the prefiguring remains of poured concrete. San Francisco seems already to have no human remains. When they were exhumed, what was left behind? Cenotaphs graved in the street? Whosoever plots their course by graves emptied of the dead will endlessly trace this city and, by their feet, make a rubbing of the epitaph. Here is one: golden gate, a name is held-over and continues to name many things: the street, the bridge, the geography of the bay, the promised land. How many are interred here? I hear deposition several ways. If we follow the Stations of the Cross, at the thirteenth we consider a deposition twice over — here, before The Deposition of Christ. This tradition holds the advent of Christ as a condescension of the Eternal into the human and into the passing of time. What, in this account, happens within human time? The Stations are displayed so that we must walk along before them, moving our feet and our eyes in step with the narration of the Passion. Christ, as we, walks in one direction, alone and to his death. He moves forward, forsaken, and, though he falls three times, he goes unerringly towards that rise of ground. His feet and his pain and his time move him ever so. By our perfect empathy with narrative, suffering and time are incorporated in the figure of Christ. And what is this thirteenth scene? Pilot has granted Joseph of Arimathea the body hung upon the cross. We see Joseph and Nicodemus deposing the body, and it is clear that the man who claimed godhead has succumbed to the hands and to the world of men. In this moment Joseph despairs of his own life and death. The self-aggrandizing sepulcher, which, in life, he has had prepared from solid rock to mark his place through generations to come, he now gives away. The messianic hopes that he has allowed to usurp his own are emptied, his work on Earth seems pitiable and he cannot but surrender it. O how they must have doubted themselves and all else. How could this be? Were we deceived? Could it be untrue? No, the body is here as proof. The Temple long gone and now, even amid such promise, hope too. Looking on at this Station, we are meant to share in this utter, incomprehensible loss. If, like the hardships in the approach to Golgotha, our lives and our times seem without meaning, all will yet be fashioned into an argument for purpose. We have testament to how a man could live humbly and yet ascend to an Eternal Kingdom — that a man can be rewarded for the life he suffers. In observation of this mystery our lives too gain purpose. Patience and piety, see your narrative through to the end; for life, like the Stations, is just a fiction by which the trials are necessary but passing. We are told that as life ends — as histories end — all time will end. Eternity awaits to reward us beyond any future of the earth. The presentation of this hallowed scene celebrates a sudden departure from a more ancient accounting of time. No longer was time to be remembered as an extension of genealogy, nor was it to be kept by the seasons of a king. It was, moreover, a departure from the cyclical corruption of the organic human body (and we will also understand this isomorphically as a rupture with the geologic cycles of erosion, sedimentation, and uplift). The Deposition, then, rehearses the Eternal entering into our own reckoning of time. Here, over the tolling of all our clocks, we tell again and again how the movements of time ravaged the body of Christ. See the geometer whose reason insists, for its own sake, on a beginning; this he marks with a point. His intention is confirmed by the point of deposition and so he draws a line from the one to the other. He believes in his drawing as its own demonstration. Now he projects his line towards the terminus that he feels must come. Tracing along his description of the line, he waits for the end; he abides in his beliefs and knows purpose and direction thereby. Only by positing its end does the segment become divisible. Now his clock will do its division by ever smaller ticks. His drawing fixes the rule of time as a simple index of fractions. Existence is set against itself, out of joint, the rocks that are and the men that wait. Whenever our frailty is articulated to usurpatious timekeepers, they declare geologic time enemy of purpose, enemy of history, enemy of liturgical time. The numbers of the Earth have an inhuman scale and no line, no telos, holds firm in such dimensions. The heresy of stones offends both history and faith by its immeasurablility. This mythology of time is robust and fully lived. Not only must we regard such myth, there are times when we have little choice but to adhere. In its machinations, however, we might begin to make sense of “disaster readiness” or “emergency preparedness”. We are always preparing for the failure of our civic body. If such cannot be the memory, then they are the performance of trauma. Just as I, before a camera, anticipate myself as an image, the corporation of San Francisco sees itself collapsed. If we allow the photographs to coordinate this argument, then the city-planning anticipates an apocalyptic scene of ruined buildings and lost street signs. Such thinking has suggested the concrete of a sidewalk as the most durable substrate for a signage of last resort. This imagined but unrecognizable cityscape enacted a civil code requiring any contractor building a sidewalk in the City or County of San Francisco to stamp the names of the streets at every corner. By design, these names would be the last of the city. The street names the city, the part for the whole; another way to name it, a metonymy where stone stands in for body. Now, were this concrete crucible to be heated anew, asphalt streets, melted to necrotic sloughs, would ooze between stone embankments and the permanence of their own names. In this anticipated scene, some apostate, perhaps, who has bargained for his life beyond the end of old myths, gives a final incantation of the city. Wait, who is this that reads the names? We cannot know his name, but trust that he will know where he would have been and that he is initiated into our intentions and compelled to act. We hope for this shade of a voice. Can it too create by the power of its words? As for us, we could not be there, or if we were, still we would be unaccustomed to take our bearings by heaps of rubble. We know store fronts, street signs, graffiti, public spaces, prohibitions of private spaces, traffic devices — these guides by which we move would be forgotten, just as we have forgotten to navigate by the stars. Ultimately we are without native resources and must look to our own feet, to the last system of navigation. What a scene! A sole figure upon the empty stage, before a vanished set, stamps his foot, knowing by some stone contrivance, where he would have been. By these documents we can discover ideological discord in the shift from the signs above to the stones under foot – césar chavez above, and the photograph of army below. It is not below as it is above. San Francisco was rebuilt into a bristling station of war power: airfield, shipyard, naval base, presidio, armory. Then, into a Cold War entrenchment. There would be an Army street in such a city. Nevertheless, military was not in keeping with another ideal of the City. The civil and labor rights activist César Chavez kept more with this other idealization. Representative of another city, army st. was removed and made parenthetical on the new signs to be hung above the street, which now read césar chavez st. (army). But below change is slower. If new names are only stamped when a sidewalk is poured, and if no stones are torn up to fulfill ideology, then there is an unconformity and many armies remain — a new kind of stratigraphy emerges. enduring, geologic aging of the anthropic rock that another time is registered. Rocks prepare for nothing and move in directions without advancing. If I possess a faculty to register two times brushing against one another, then I say that concrete is poured out of our time and hardens into the condition of Earth without us. Like martyrs, we leave witness to ourselves, poured out in concrete language. Our geologic depositions are anxious words on anxious stones — concretions of opacity, orthography, teleology. 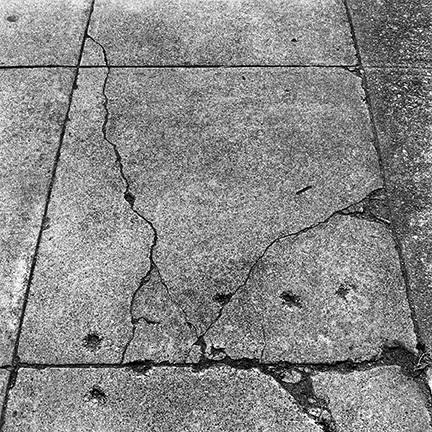 In the concrete that will always be the last proof of this city, ancient names or unintelligible testaments rest alongside a new set of fossils — pigeon, dog, and human foot prints, casts of fallen flora in a hardening sidewalk. The photographs are unforgiving: we grave in misspellings, in gas-station-serviceable letters forced to stand upside-down, in erosions and in partial erasures. When does stratigraphy exist? There are no moments in the existence of rocks. Nor are there moments in a photograph. This is the irony: we make photographs with a thought to the moment and all we can do is hold an image out against its time, stilling our subject, perhaps like death, but more like a rock. That is to say that a photograph is always already a document out of time, out of joint with our chronometers. I doubt that photography can ever do so, but this does suggest that an exposure removed from the proceedings of historic time, hardened out of us, would appear as the Earth itself — a stack of photographs is a stratified formation not a narrative. Once down, a deposition rests for time, until uplift might expose it to a surface or to a light, or to a ghostly intelligence. The end of human time, already eager to be read in the streets of our cities, will resemble, as always, the condition of rocks without us. The rash of human activity will fade, an anthropic flux, its only record yet another geologic stratum. At the end, we will not be present to give an account of ourselves; rather our depositions, given under the oath of permanent ruin, will be read out from the archive of the Earth. 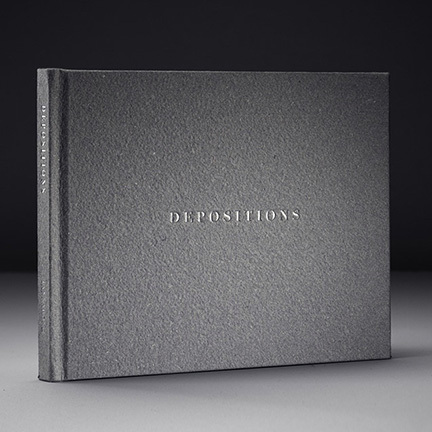 Depositions was designed and printed by A. Iannarone and J. Fetter-Vorm, in San Francisco, CA & Brooklyn, NY. The photographs are printed with archival pigmented inks on Hähnemuhle Inkjet Rag paper. The text is set in Monotype Didot and printed letterpress. Handbound and published in a numbered edition of fifty copies. $200.00. A second edition, which forgoes the expense of reproducing the photographs, is printed letterpress on Mohawk Superfine paper. Published in a numbered edition of two-hundred copies. $15.00.